The dust has settled at Grosvenor Casino Coventry after four days of fun and action-packed poker. 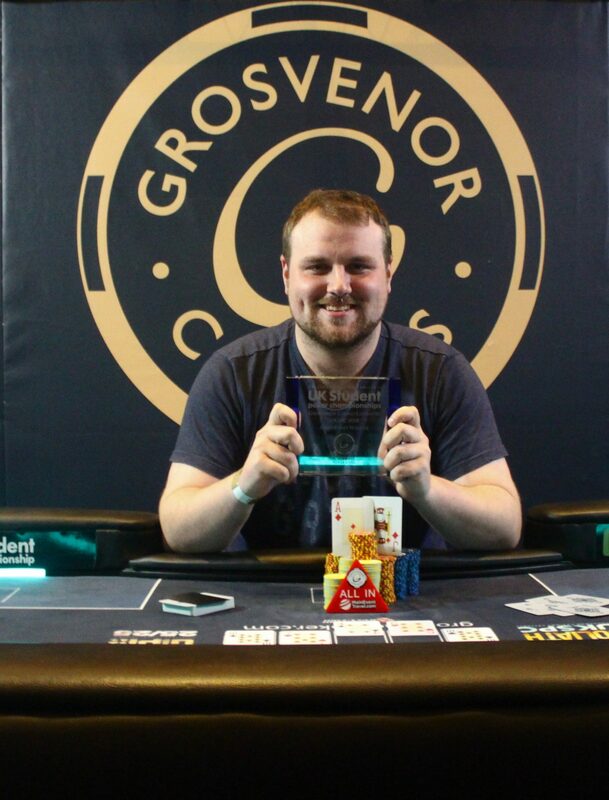 It was Grosvenor Casinos’ 5th time hosting this prestigious event and the venue was delighted to welcome 897 runners to the UKSPC Main Event along with outstanding entry numbers throughout the week. Grosvenor Casinos thoroughly enjoyed witnessing students having fun and making the most of the week’s offering. Congratulations to Oscar Marsland (HighRoller winner), Marios Zervoudis (Bounty winner), Thomas Hitchman (PLO winner), Timothy Richards (Super HighRoller winner), Lucas Durney (6Max winner), Michael Holmes (Turbo winner), Benjamin Crozier (Turbo winner) and Katie Jones (Turbo winner). However, there can only be one student who could go back to halls with the ultimate bragging rights of the 2018 UKSPC Main Event title and this year this was earned by Gareth Cresswell. Cresswell pocketed the £6,760 first prize after beating 897 runners to first place. The psychology student, who was once a semi-professional footballer, is working on a on a PGDE at Liverpool John Moores University.